Capillary Gel Electrophoresis (CGE) is a powerful, fast and reliable method to determine the distribution of plasmid topologies within your plasmid DNA sample. PlasmidFactory offers the determination of the three most common plasmid forms (ccc-monomer, ccc-dimer, oc-forms). This service is offered both in combination with our contract manufacturing service and for your self-made plasmid. The CGE analysis is already included in the production of our ccc Grade qualities (ccc Grade basic and ccc Grade classic), for Research Grade quality this service is available on request. Futhermore the CGE analysis is offered in combination with our storage and logistics service to monitor the stability of the plasmid DNA during storage. Rely on PlasmidFactory’s longtime experience in plasmid separation by Capillary Gel Electrophoresis. Profit from this unique technology in your routine laboratory work. Plasmids can assume various conformations: covalently closed circular (ccc), open circular (oc) and linearized. The only reliably active conformation is ccc (see Figure A). PlasmidFactory produces high-purity DNA, whose quality markedly exceeds that of kit-based systems. 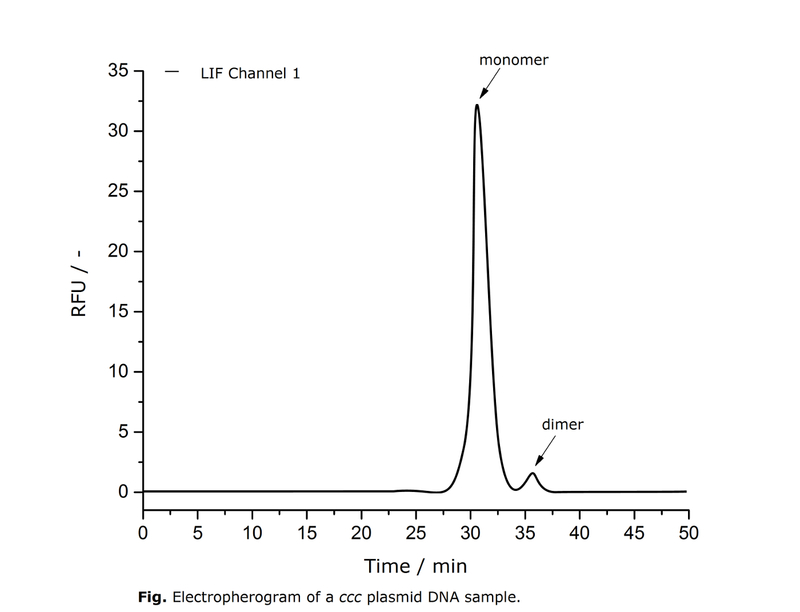 Our unique capillary gel electrophoresis (CGE) technology allows determination and quantification of the proportion of the ccc form. CGE analysis can be ordered optionally for every plasmid production or independently for external DNA samples. It documents the degree of plasmid homogeneity – a parameter not only of practical interest for achieving optimum transfection results but also required from a pharmaceutical perspective. The main contaminant of kit-based plasmid DNA – bacterial chromosomal DNA – cannot be quantified by this method. PlasmidFactory uses only specific E. coli strains, characterized and optimized, for production of plasmid DNA. The patented procedure for the processing of plasmid-containing cells is based on the alkaline lysis procedure. A well-known problem with the subsequent purification by means of ordinary ion exchange chromatography (plasmid kits) consists of contamination with bacterial chromosomal fragments (often called «genomic DNA» which is inappropriate since plasmids do also form a part of the genome), which bind specifically or unspecifically to the column matrix, just as plasmid DNA does. In the further course of the plasmid extraction procedure, this bacterial chromosomal DNA is often not separated from the plasmid. This will result in a high degree of contamination with bacterial chromosomal DNA, which may on the one hand significantly skew plasmid concentration measurements and on the other induce immune responses of the target expression system, and, thus, jeopardize the success of your experiments. PlasmidFactory’s ccc-Grade DNA qualities are virtually free of bacterial DNA (see Figure B); in our other qualities (Research Grade), the proportion of these unwanted contaminations is significantly reduced compared to kit-based systems. In addition, quantitative analysis of the bacterial chromosomal DNA (qPCR) is available to customers. Lipopolysaccharides (LPS), often referred to as endotoxins, are produced by gram-negative bacteria such as E. coli and detected by the immune system of eukaryotic cells. This can trigger an immune response and result in reduction of gene expression. In popular kit preparations, LPS content may vary very widely and have undesirable effects on the results of the experiment. During each plasmid production, PlasmidFactory measures the LPS content and can guarantee, upon request, a content of less than 0.1 EU / µg of DNA. Thus, the levels undermatch those of all other production processes. PlasmidFactory has developed a special production process for plasmid DNA which generally discards the use of substances of animal origin to the greatest possible extent. Upon request, a recombinant RNase is used in the production process to result in completely «animal-free» production. Avoiding use of animal-based substances is of importance for clinical applications, since these substances may pose a safety risk. In addition, the use of enzymes – including RNase – can be avoided completely during production and purification, since the RNA is removed chromatographically («enzyme-free» procedure). At PlasmidFactory, plasmid amplification in E. coli cells is always carried out in the fermenter and under controlled conditions, because it is not possible to guarantee the reproducibility of the produced biomass when shake flasks are used. The quality of the product is constantly monitored and documented. A complete list of the quality controls and analytic methods can be found on the Quality Control page.